The kitchen is one of my favourite places in our home - I love cooking and see the kitchen as a really important social space. We're lucky enough to have a really lovely kitchen in our rented place; its big enough to fit a dining table which we eat at most nights, and is bright and fresh. For me, the perfect kitchen is one that is enjoyable to cook in but also nice to look at and a space you want to spend time in. I love cooking with fresh herbs, and am always after ways to grow and store them which is both practical and attractive. I think I've found the perfect answer! I spotted these on the Ikea app last week and am trying to find the first date in my diary where I can get down to my local store (Southampton or Croydon, we're bang inbetween the two!) and pick a couple up. Great if you're short on space - these can hang from the ceiling in the kitchen and are stackable to allow for maximum use of space. 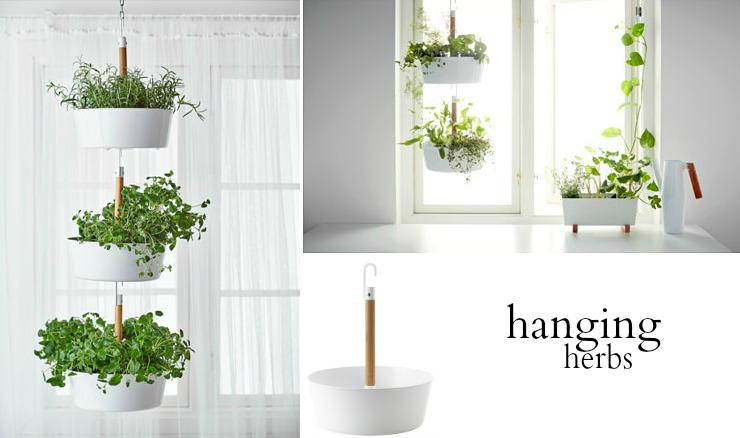 Of course, these aren't just perfect for hanging herbs. I love the idea of these in my sitting room for that 'outside inside' feel! The circular planters are a real bargain at just £8 each. I would place potted herbs into the planters in the plastic pots to allow for drainage into the planter - you don't want to drown them. They unhook easily for watering or snipping, so simple. They also have a rectangular planter in the same style. These are lovely! I love the idea of having fresh plants and herbs in the kitchen! I've been toying with the idea of wooden crates to store some herbs in and maybe have them sitting in my window. These seem great for utilising space in a smaller kitchen too. © Lizzie, Lately | All rights reserved.